Tor Browser for Android 1.0a3 is now available from the Tor Browser Project page and also from our distribution directory. Moreover, we backport a defense against protocol handler enumeration developed by Mozilla engineers. Unfortunately, in this release we are temporarily introducing a regression due to a potential proxy-bypass bug within some versions of Android. Tor Browser for Android will not download a website's "favicon" in this release (the small image shown beside the title of the webpage in the list of tabs). From our investigation into this bug, we found Android versions before Android Oreo (Android version 7 and earlier, API level 25 and earlier) leak some information about which webpage the browser is loading. This was corrected in newer versions of Android, however this temporary regression is necessary because it is likely most users have an older version of Android, and there may be other bugs we haven't discovered yet. One bug in the Android networking code is one bug too many. We are working on a new way of downloading these icons. cypherpunks account has been - for the first time in a heck of a long time - been completely maltreated all because of online fascist tendencies exhibited by teor (a fine and even super tor guy). Now a lot of TB bugs that weren't diagnosed were because of us not bothering to do the testing since cypherpunks - the only multiaccount on trac - being restricted. AH, how much we miss the good old simple times! Arma if you're reading this please take immediate action. It is not hard to register in trac. You even don't need to give some email. Just pass CAPTCHA, reload page (relogin), and that's all. - You can't select anything, like text. It's not possible to copy or paste anything. - Downloads don't work correctly. - Screenshots are impossible to take, making it necessary to switch to a less secure browser to take a screenshot of a site. Yes, unfortunately these are known bugs, but thanks for the comment and testing this alpha version. Downloaded from Fdroid right now propably 1 hour early ,scripts are giving me issues, don't know exactly what it means :"A script or more is attempting working not properly " just trying typeing on tor check on tor project, else an app has stopped to works while I was trying checking ttb ,very sad .Don't know how to do solving .Android 5. Anyway thank you so much for your hard work, I think you are looking for doing all your best. Best regards your affectionated follower, I really love ttb on android. 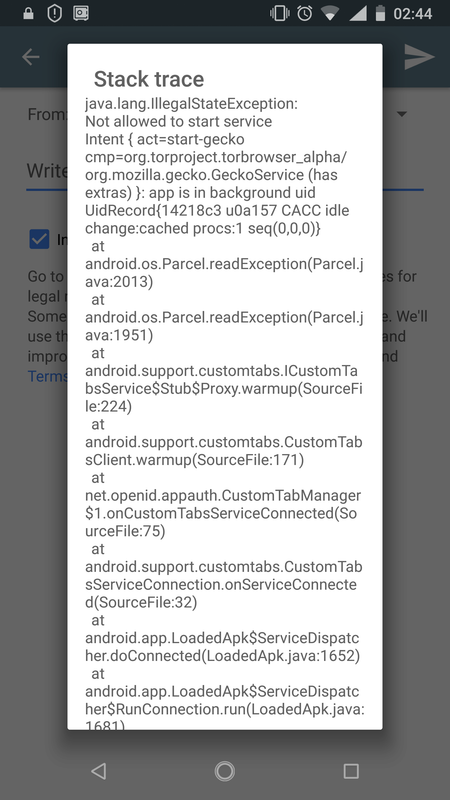 i can't download ascii armored GPG sigs with many Android Firefox versions. That would be handy, of course, if then in the Stable even orbot falls away. I am testing the browser just now and so far and it is stable. What bothers me that here similar to Fennec F-Droid once the Pocket recommendations are enabled and actually should not change the settings at TOR. I deactivated them anyway because they annoy me. Maybe someone can help. I was using the tor browser alpha and when I went to clear my private data it said that it couldn't remove it all. What did you try to do (which steps allow us to reproduce your problem)?